Sure, Colin the Chameleon's special color-changing skin makes it easy to hide from a fearsome tiger or to hunt a tasty fly. But when Mildred the Elephant, Wally the Warthog, Gerry the Giraffe, and Colin's other friends accidentally step on, sit on, and nibble on him because they can't see him? Well! It's time for Colin to learn how to stand out. 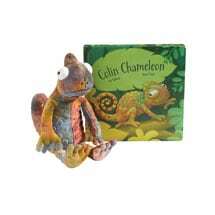 Young readers-in-training will giggle along with this fun story, and our soft multicolored 12" Colin Chameleon Plush is a perfect match for storytime! For ages infant to 4. Book and plush sold separately.